New, high quality hat. Natural polar fox fur combined with natural leather gives great warmth and coziness. This style is called "Zimushka" or in Russia. It is one of the classic styles in Russia. This hat is extremely comfortable to wear. 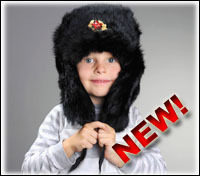 This style of ushanka hat can be easily transformed. You can use the pom-poms like laces as they can be bound together under the chin, at the nape of the neck, or on the top of the head.